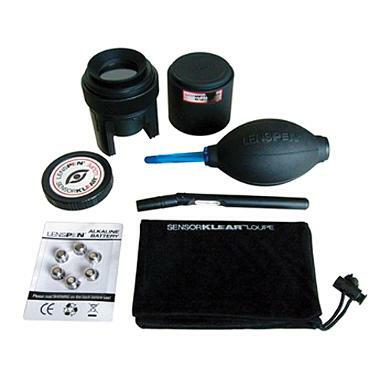 This Lenspen SensorKlear Loupe Kit model SKLK-1 is the perfect companion to help you clean your camera and camera sensor as well as, camcorders, binoculars, telescopes, microscopes, rifle scopes, night vision gear and the list goes on. Use the SensorKlear Loupe to locate dust particles on the sensor surface then the LensPen Hurricane Blower to blow them away. For any remaining specs, use the SensorKlear II Pen to do a final clean-up. The tip of the pen is concave which should join with the lens surface on various optics. The LensPen tip can be used up to 500 times!